CALGARY, July 6, 2017 /CNW/ - Paramount Resources Ltd. (TSX: POU) ("Paramount" or the "Company") is pleased to announce that it has entered into an agreement with certain subsidiaries of Apache Corporation to acquire Apache Canada Ltd. ("Apache Canada") for $459.5 million, plus working capital and other monetary adjustments (the "Apache Canada Acquisition"). Paramount plans to fund the Apache Canada Acquisition with cash on hand and no debt will be assumed. Paramount has also entered into an agreement with Trilogy Energy Corp. ("Trilogy") to merge by way of an arrangement under the Business Corporations Act (Alberta), pursuant to which Paramount would acquire all of the common shares and non-voting shares of Trilogy not already owned by Paramount in exchange for Class A common shares of Paramount on the basis of one Paramount share for every 3.75 Trilogy shares (the "Merger"). These strategic transactions are the next steps in Paramount's transformation following the sale of the Company's Musreau deep cut gas processing plant and properties in 2016 and the repayment of all debt then outstanding. The Company is redeploying its cash on hand and immediately increasing its production, cash flows, reserves and landholdings. Paramount, upon acquiring Apache Canada and merging with Trilogy, will become a Montney, Duvernay and Deep Basin focused intermediate exploration and production company with the financial strength to accelerate the development of a portfolio of top-tier resource plays, unlocking the value of the underlying resources. The integration of the three companies will generate operational synergies, optimize cost structures, offer financial flexibility and provide economies of scale. Paramount's diversified production base will be capable of delivering repeatable, low risk growth and generating free cash flow in a variety of price environments. 176,000 net acres of fee simple lands in southern Alberta and additional minor properties, all of which may be monetized in whole or in part. "These transactions represent Paramount's next significant resource capture, building on the transformation of the Company we initiated in 2016. We have replaced more than the liquids-rich Montney lands and reserves we sold in 2016 and acquired a suite of top-tier development opportunities," said Jim Riddell, Paramount's President and Chief Executive Officer. "We believe the 46,000 Montney acres we are acquiring at Wapiti are a continuation of Paramount's liquids-rich resource play at Karr, where our drilling and completion programs have been delivering record results for Paramount. These transactions combine Trilogy's and Apache Canada's complementary land positions at Kaybob, materially increasing the size of those Montney and Duvernay resource plays. "The combination of these three organizations will result in synergies in field operations, general and administrative expenses and development capital expenditures, as well as the optimization of processing and transportation infrastructure and commitments." The Apache Canada Acquisition is not conditional on the completion of the Merger. Closing of the Apache Canada Acquisition is expected to occur in August 2017, subject to the receipt of regulatory approvals and other customary closing conditions. The Merger is conditional upon, among other things, the completion of the Apache Canada Acquisition and is targeted for completion in September 2017. * Note: Apache Canada landholding information provided by Apache Canada. Trilogy landholding information is from Trilogy's public disclosure documents. Sales volumes and netback information provided by Apache Canada. Excludes sales volumes and netbacks associated with Apache Canada's Midale, House Mountain and Provost properties, which have either been sold or are in the process of being sold by Apache Canada. Sales volumes and netback information is from Trilogy's public disclosure documents. Paramount's independent reserves evaluator, McDaniel, updated the Company's reserves evaluation to June 1, 2017. The Company's proved plus probable reserves increased 27 percent to 146 MMBoe compared to 115 MMBoe as of December 31, 2016. The increase in reserves is primarily due to the performance of new wells brought on production at the Karr property in 2017. Reserves evaluated by McDaniel as of June 1, 2017. Volumes disclosed are working interest reserves before royalty deductions. Readers are referred to the advisories concerning Oil and Gas Measures and Definitions in the Advisories section of this news release. Paramount's reserves volumes exclude probable bitumen reserves related to the Company's oil sands properties. Excludes reserves volumes associated with Apache Canada's Midale, House Mountain and Provost properties, which have either been sold or are in the process of being sold by Apache Canada. NGLs means ethane, propane, butane, pentanes plus and condensate. Reserves evaluated by McDaniel as of June 1, 2017. Readers are referred to the advisories concerning Oil and Gas Measures and Definitions in the Advisories section of this news release. The estimated net present values of future net revenue disclosed in this document do not represent fair market value. Revenues and expenditures were calculated based on McDaniel's forecast prices and costs as of April 1, 2017. Excludes the Company's oil sands properties. Excludes Apache Canada's Midale, House Mountain and Provost properties, which have either been sold or are in the process of being sold by Apache Canada. The acquisition of approximately 176,000 net acres of fee simple lands in Central Alberta. Apache Canada has recently sold its Midale and House Mountain properties and has entered into an agreement with another party to sell its Provost properties. These three properties are not part of the Apache Canada Acquisition. Apache Canada's primary developments are located at Wapiti, Kaybob/Ante Creek and Central Alberta. 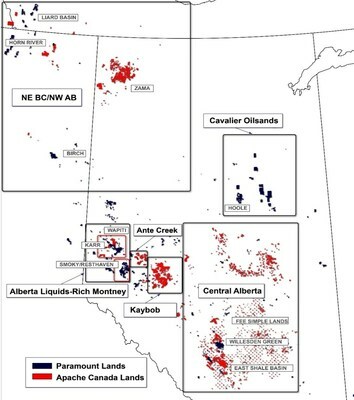 Apache Canada's Wapiti area includes approximately 46,000 (45,800 net) acres of Montney rights in the core of the over-pressured, liquids-rich fairway in the Alberta Deep Basin. Paramount is ready to commence a large-scale development of these resources and add new production in mid-2019 when a new third-party processing facility is completed (the "Wapiti Montney Project"). The Company plans to develop Wapiti utilizing the well completion designs that have been successfully executed at Paramount's Karr development. The Company expects Wapiti Montney Project natural gas volumes to increase to approximately 150 MMcf/d by 2021 as development proceeds and multi-well pads are completed and brought-on production. The reserves evaluation for Apache Canada prepared by McDaniel includes 96 net undeveloped well locations for the Wapiti Montney Project, representing the development of approximately only 20 percent of the total Wapiti lands. A midstream arrangement with a third-party owner/operator is in place for the turn-key Wapiti Montney Project. The first phase, scheduled for startup in mid-2019, includes 150 MMcf/d of sour gas processing capacity with acid gas injection capabilities and 25,000 Bbl/d of condensate processing capacity, as well as a gathering pipeline system and field compressor stations. Paramount will have priority access to the full 150 MMcf/d of capacity, with a take-or-pay commitment for a portion thereof. This gathering and processing arrangement allows Paramount to focus on drilling and completing wells while a third-party midstream operator concentrates on building and operating the infrastructure. Firm-service natural gas transportation is also in place for the Wapiti Montney Project, with 50 MMcf/d of firm-service capacity available in mid-2019, which can be increased to 130 MMcf/d by 2020. The Kaybob/Ante Creek area includes approximately 490,000 (312,000 net) acres of land targeting liquids-rich natural gas production from the Duvernay, Montney and various Cretaceous horizons, including approximately 38,000 (24,000 net) acres of core Duvernay rights. Liquids-rich growth production will be processed through a third-party turn-key midstream solution with up to 100 MMcf/d of priority processing service. Production from the Kaybob area is for the three months ended March 31, 2017 was approximately 20,000 Boe/d, including approximately 20 percent liquids volumes. The Central Alberta area primarily consists of low-decline properties with resource development potential from the East Shale Basin Duvernay and the Glauconite, Cardium and Ellerslie formations. Apache Canada also owns approximately 176,000 net acres of fee simple lands in the Central Alberta region. Production for the three months ended March 31, 2017 was approximately 14,000 Boe/d, including approximately 38 percent liquids volumes. Paramount plans to pro-actively manage the other Apache Canada assets acquired in the Northwest Territories, northeast British Columbia and northwest Alberta and explore opportunities to monetize the fee simple lands and certain other properties. Operating information provided by Apache Canada. Excludes the results of the Midale, House Mountain and Provost properties, which have either been sold or are in the process of being sold by Apache Canada. HSBC Securities (Canada) Inc. is acting as Paramount's exclusive financial advisor on the Apache Canada Acquisition. Norton Rose Fulbright is acting as the Company's legal advisor. Trilogy is a petroleum and natural gas-focused Canadian energy corporation that actively develops, produces and sells natural gas, crude oil and natural gas liquids. Trilogy's geographically concentrated assets are primarily high working interest properties that provide abundant low-risk infill drilling opportunities and good access to infrastructure and processing facilities. Trilogy's common shares are listed on the Toronto Stock Exchange under the symbol "TET". 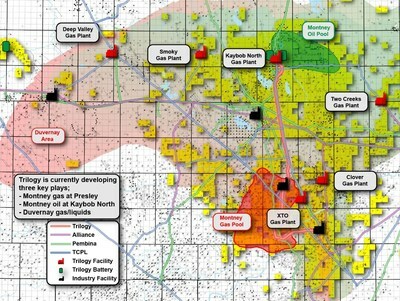 Trilogy discovered the Kaybob Montney oil pool in 2011 and owns approximately 32,000 net acres of land in the play. Approximately 125 wells have been drilled on the play to date. In its 2016/17 drilling program, Trilogy has tested increased proppant loading intensity with a slickwater fluid system, which has yielded results similar to the original wells drilled into the core of the pool. Trilogy's Presley Montney natural gas development includes approximately 38,000 net acres of land. Trilogy had drilled 82 horizontal wells on the play as of December 31, 2016. Trilogy holds approximately 118,000 net acres of Duvernay rights at Kaybob. The lands are strategically positioned in the core of the Duvernay, with offsetting operators initiating full-scale developments on adjacent lands. Multi-well pad development is expected to yield significant cost reductions relative to previous Duvernay wells. In addition to its oil and gas resources, Trilogy owns a working interest in five gas plants, three major oil batteries plus an extensive gathering system in the Kaybob region. Paramount owns approximately 15% of the common shares and non-voting shares of Trilogy and Clayton H. Riddell is the principal shareholder and Chairman of both Paramount and Trilogy. The boards of directors of Paramount and Trilogy each established special committees of independent directors to consider and make a recommendation with respect to the Merger. The Paramount special committee engaged Peters & Co. Limited as its financial advisor and Burnet, Duckworth & Palmer LLP as its legal counsel to assist with its review. The Paramount and Trilogy special committees jointly engaged Deloitte LLP ("Deloitte") as independent valuator to provide certain financial advisory services in respect of the transaction, including the preparation of formal valuations of the Paramount shares and the Trilogy shares in accordance with Multilateral Instrument 61-101—Protection of Minority Security Holders in Special Transactions ("MI 61-101"). The Paramount and Trilogy special committees each recommended approval of the Merger to their respective boards of directors. Prior to making their recommendations, the special committees received from Deloitte its valuation conclusions for each of Paramount and Trilogy. In addition, the special committees were provided by Deloitte with a verbal opinion indicating that the proposed issuance by Paramount of one Paramount share for every 3.75 outstanding shares of Trilogy is fair, from a financial point of view, to the shareholders of both Paramount and Trilogy. Clayton H. Riddell has advised that he supports the Merger. The Merger is subject to shareholder and court approvals, including the minority shareholder approval required by MI 61-101 by the shareholders of each of Paramount and Trilogy, and the fulfilment of other conditions that are typical for transactions of this nature. A joint information circular for the special meetings of shareholders of Paramount and Trilogy to consider the Merger is expected to be mailed in August 2017. The special meetings of shareholders are expected to be held in September. If all approvals are received, and other closing conditions satisfied, the Merger is expected to be completed in September 2017. The Arrangement Agreement will be filed on SEDAR (www.sedar.com). Clayton H. Riddell will remain as Chairman and Jim Riddell will remain as President and Chief Executive Officer of Paramount following completion of the Merger. It is anticipated that the independent directors of Trilogy will become directors of Paramount upon completion of the Merger. The senior management of Paramount and Trilogy are all expected to be part of the Paramount management team following completion of the Merger. Upon completion of the Merger, Paramount will have approximately 134.7 million shares outstanding (140.2 million shares on a fully diluted basis), based on the currently outstanding shares of Paramount and Trilogy, and Clayton H. Riddell will beneficially own or control, directly or indirectly, approximately 44% of the outstanding shares of the Company. The outstanding high yield notes of Trilogy will remain outstanding following completion of the Merger. The Merger will not trigger any change of control payments. Following the Merger, the outstanding Trilogy options will entitle the holders to acquire Paramount shares rather than Trilogy shares, based on the exchange ratio for the Merger. Peters & Co. Limited is acting as financial advisor and Burnet, Duckworth & Palmer LLP is acting as legal advisor to the Paramount special committee. Raymond James Ltd. is acting as financial advisor and Stikeman Elliott LLP is acting as legal advisor to the Trilogy special committee. Norton Rose Fulbright is acting as company counsel for Paramount and Trilogy. In connection with the annual review of Paramount's existing credit facility, the facility has been increased from $100 million to $300 million and the revolving term of the facility has been extended to April 30, 2018. It is anticipated that further amendments will be made to the facility following closing of the Apache Canada Acquisition and the Merger. Paramount is an independent, publicly traded, Canadian energy company that explores and develops unconventional and conventional petroleum and natural gas prospects, including long-term unconventional exploration and pre-development projects, and holds a portfolio of investments in other entities. The Company's principal properties are primarily located in Alberta and British Columbia. Paramount's Class A common shares are listed on the Toronto Stock Exchange under the symbol "POU". An investor presentation relating to these transactions will be posted on the Company's website (www.paramountres.com). general business strategies and objectives of Paramount. In addition, information and statements herein relating to "reserves" are deemed to be forward looking information as they involve the implied assessment based on certain estimates and assumptions that the reserves described exist in the quantities predicted or estimated, and that the reserves can be profitably produced in the future. general business, economic and market conditions. other risks and uncertainties described elsewhere in this news release and in Paramount's other filings with Canadian securities authorities. The foregoing list of risks is not exhaustive. For more information relating to risks, see the section titled "RISK FACTORS" in Paramount's current annual information form. The forward-looking information contained in this news release is made as of the date hereof and, except as required by applicable securities law, Paramount undertakes no obligation to update publicly or revise any forward-looking statements or information, whether as a result of new information, future events or otherwise. In this news release, "netback" and "free cash flow" (the "Non-GAAP Measures") are used and do not have a standardized meaning as prescribed by IFRS. Netback equals petroleum and natural gas sales less royalties, operating costs and transportation and NGLs processing costs. Netback is commonly used by management and investors to compare the results of the Company's oil and gas operations between periods. Free cash flow equals funds flow from operations minus maintenance capital and is used to measure whether net cash flows are positive or negative after deducting capital amounts incurred to maintain production at current levels. The calculation of free cash flow excludes capital amounts incurred to increase production and capital amounts incurred in prior periods. Non-GAAP Measures should not be considered in isolation or construed as alternatives to their most directly comparable measure calculated in accordance with GAAP, or other measures of financial performance, calculated in accordance with GAAP. Non-GAAP Measures are unlikely to be comparable to similar measures presented by other issuers. This news release contains disclosures expressed in "Boe/d", "MBoe" and "MMBoe". Oil equivalency volumes have been derived using the ratio of six thousand cubic feet of natural gas to one barrel of oil. Equivalency measures may be misleading, particularly if used in isolation. A conversion ratio of six thousand cubic feet of natural gas to one barrel of oil is based on an energy equivalency conversion method primarily applicable at the burner tip and does not represent a value equivalency at the well head. The term "liquids" is used to represent oil, condensate and Other NGLs. The term "Other NGLs" means ethane, propane and butane. During the three months ended March 31, 2017, the value ratio between crude oil and natural gas was approximately 23:1. This value ratio is significantly different from the energy equivalency ratio of 6:1. Using a 6:1 ratio would be misleading as an indication of value.